Do you have a blog or other type of website that you’ve registered a domain name for? If so, you need to know about a scam targeting domain owners that’s making the rounds yet again. As you know, when you registered your site’s domain name you were required to supply your postal mailing address and email address as part of the registration process. Both of those addresses are part of the official registration info that can be publicly accessed by anyone on the Internet by running a simple “Whois” query on your domain name. Well, scammers are “scraping” the postal addresses and/or email addresses from the “Whois” info for every domain they can find and sending the domain owners realistic-looking, but scam invoices for renewing the domain. 1 – Real renewal notices are almost always delivered by email, not postal mail. If one lands in your physical mailbox, it’s almost certainly a scammer attempting to separate you from your hard-earned money with no real benefit to show for it. 2 – Only the domain registrar that your domain name is currently registered with will send you a legitimate renewal notice. For example, if your domain is registered at Godaddy and you receive a renewal notice from a different company, you can rest assured that the notice is an attempt to scam you. 3 – The renewal fee mentioned in the invoice will be several times what you paid to register the domain in the first place. 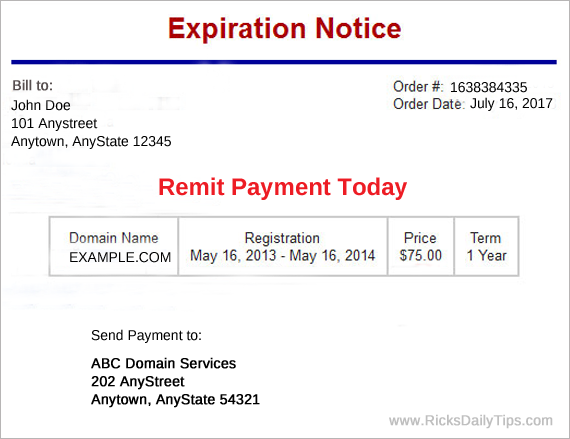 Scam renewal notices typically say you owe $75 or more to renew your domain for just one year. Godaddy charges about $15 per year for their .com domain renewals, and some registrars charge even less. As you can see, it’s actually pretty easy to tell a fraudulent domain renewal notice from a legitimate one. Another variation on this scam is an offer to “promote” your blog/website. 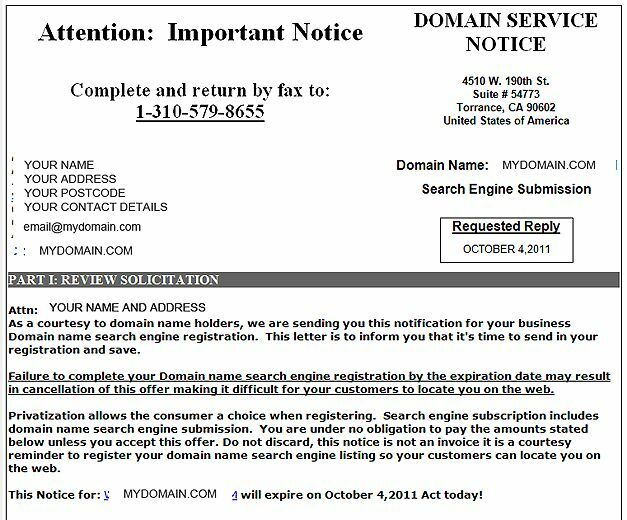 These notices are designed to look like a domain renewal notice but they’re actually offers for a “search engine registration” service – something you don’t even need thanks to Google and Bing’s automated crawlers (if there are external links to your blog/site the search engines will find it on their own). 1 – Throw the paper “invoice” you received into the nearest trash can. 2 – Log into your account at your real registrar’s website and check your domain’s renewal status. If it does need to be renewed you’ll be able to do it from within your account. Don’t fall prey to the scammers who send out those shady “invoices”. Only deal with your domain’s current registrar unless you’re unhappy with their service for some reason. If you do wish to switch to a different registrar, find one you like and thoroughly check them out and then ask them to transfer your domain from the current registrar to them. 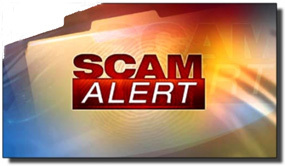 Bonus tip #1: Click here to read about some of the other scams that are making the rounds right now.